This bar looks nice! Nice work by Bally’s. So has anybody gone and hung around for awhile at the new bar? Is this one a non smoking bar since it's next to the food? 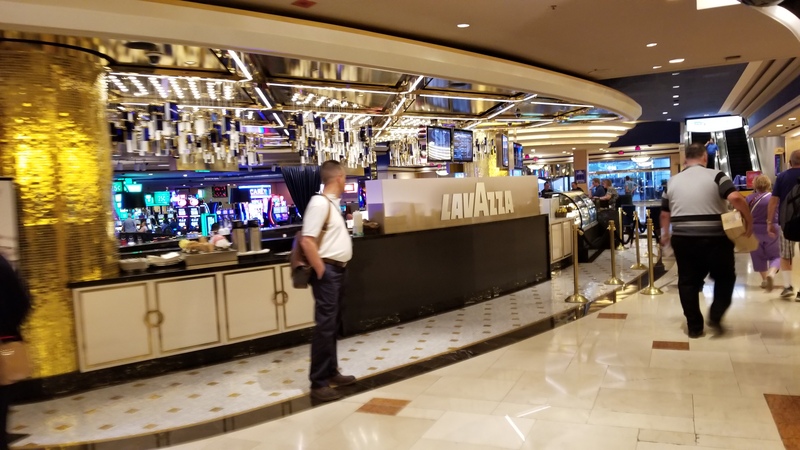 We're staying at Bally's this trip and was hoping to find a VP bar similar to what we found at Harrah's next to their food court. My other fave was TAG Bar... Alas. Quick question: does this new lobby bar replace the VP bar that's further down the walkway near the Resort Tower? And is there still a VP bar near the Keno and Jubilee Tower entrance? No bars were removed, just added this one. Can we use and get TR points at the lobby bar? If it has video poker it's a CET property so the answer is yes. If it's a sublease (no poker) you probably still could but it may not be for full value. Bar is gorgeous; we were able to belly up the day they opened this October...and those VP machines were the TIGHTEST I have played on ANYWHERE. Seriously--DH & I each put $20 in side by side machines & did not get a SINGLE win (or even a push) in 16 spins each. Even by CET rotten bartop paytables, that is unheard of. This doesn't make sense. Vp is random and is not 'set' by the casino except by the pay table. Losing every hand in that small a sample is within normal statistical range. You're confusing your losses with slot machines...with which no one really knows what their machine has been set. Vp you know your payback before you even put a dollar in it. Video poker is completely random. It's the same thing if you played with a real deck of cards. 16 spins isn't nearly a large enough sample size. I've been there before hitting nothing playing good pay tables downtown and at Cromwell. Anyway, yeah they did a nice job on that bar. Renovations they've done on the rooms get an "A" from me as well. Played there for a bit last trip and enjoyed myself. The piano music was a nice touch as well. Too bad my drink ended up being a $100 drink as it often does at Ballys. "my drink ended up being a $100 drink as it often does at Ballys." I am well aware of the randomness of VP. It is my 2nd game of choice after poker & I have spent many hours perfecting my play (computer programs/apps). I have played all over Vegas, as well as other places. It is an extraordinarily RARE occurrence for there to be NO hit on 16 spins; actually 32 spins as we were both playing. I have had only 1 hit on a $20 & consider that VERY RARE as well. That being said, it was simply an observation of the session. The way I worded it did make it appear that I thought the crap paytables were connected to the machine, but wasn't my intent. Having played thousands of hours of video poker over the years, it is amazing how certain machines at various casinos seem to play differently--there are places/machines that I get little play out of (knowing the RNG, I continue to try them all over...) and others that I consistently do. There is no advantage to changing games/machines/casinos--but there is no disadvantage either (well, except paytables/comps). Whatever you gotta do to keep it fun & interesting for you, go for it. Trust me, the casino wants you to have the PERCEPTION that you are winning more if you think changing games/machines! You guys saying it’s no big deal to run through a $20 without a hit at $.25 max bet VP are nuts. Assuming basic strategy on a full pay JOB machine, going 0/16 happens 1 in 16000ish Times. Both of them going 0/16 (0/32) happens 1 in a little over 260,000,000! Either you’re exaggerating big time or that might be something worth looking into. Never packed. Maybe to noisy from front desk construction?